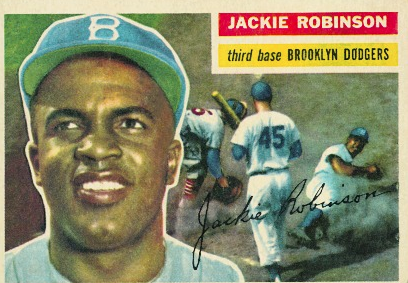 Notice in the title I have referred the pioneering civil rights leader as Jack Robinson not “Jackie”. That is because in interviews his wife Rachel (Still living at 96!) has mentioned that is what she always called Jack. So far I have made about three dozen colored pencil drawings and this is one of my favorites. I think to myself the drawings may not look like who I want them to, but it does sort of look like a person. 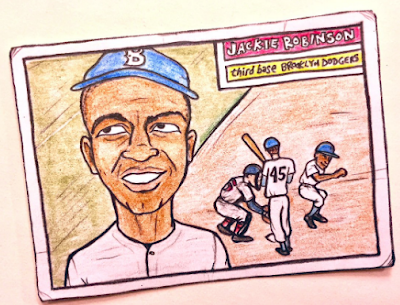 While this work is inspired by Robinson’s 1956 Topps card it is far from a replica. First off, as mentioned above, is the name modification. The next major difference is that I changed the play at the plate – I chose the iconic image from Robinson’s steal of home versus the Yankees in game 1 of the 1955 World Series. The play is filled out in color while the portrait side of the card is done with an abstract black & white background. This is a nod to the crossing of the color line – further symbolized by the foul line in the action shot. 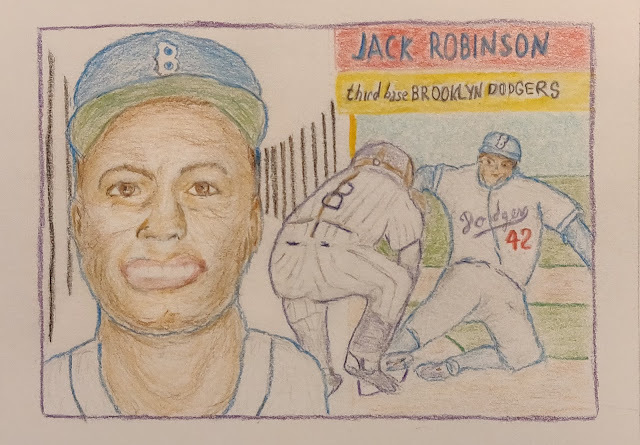 This barrier is also illustrated by the staccato lines behind Jack’s headshot which echoes a fence – the line unbroken prior to Jackie Robinson entering major league baseball. I added a 42 to Jackie’s uniform. 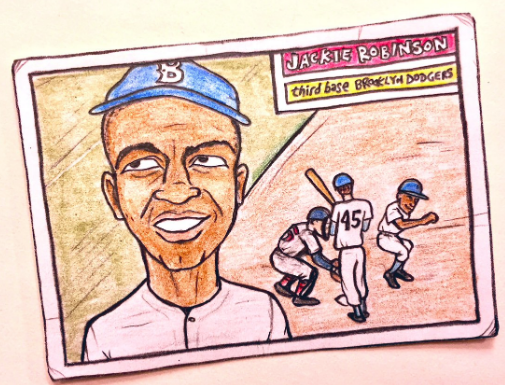 This is not historically accurate for Dodgers jerseys of the era, but I felt the number has become so much a symbol of our cultural memory it belonged in the illustration. For comparison we present here the original 1956 Jackie Robinson card featuring the full background and original action shot. Gummy Arts put together this more faithful rendition of the card. Carroll also uses the B/W vs color to mark the breaking of the color barrier. His works are mosaics created by using discarded baseball cards to create a new image. Great job! 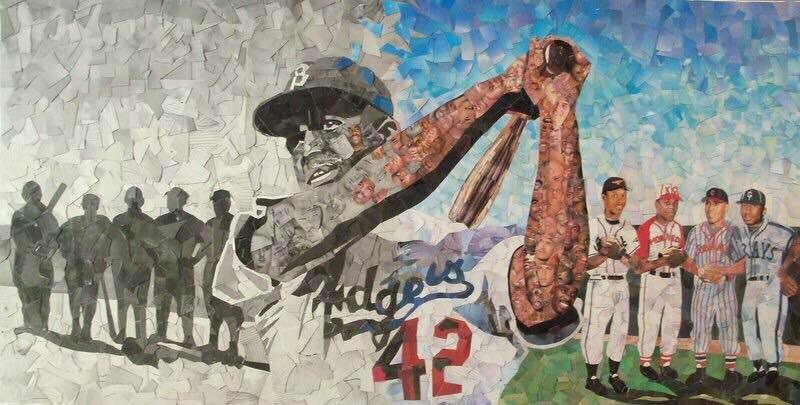 Love all three pieces of art in this post.